As Carl Edwards won the O'Reilly Auto Parts Challenge at Texas Motor Speeday through a green-white checkered run to the finish, attention to the NASCAR Nationwide Series quickly shifted to the 3rd place #22 Dodge driven by Brad Keselowski. Leaving the O'Reilly Auto Parts Challenge with a 465-point lead over Carl Edwards, Keselowski clinches the 2010 NASCAR Nationwide Series championship with two races still left to be run. On the way to his first NASCAR overall points title, Brad Keselowski's efforts were helped by 24 top-5s along with 27 top-10 finishes. Running at the end of every race, the worst result for the #22 Dodge this season was 21st at Chicagoland Speedway. Accumulating 6 wins on the 2010 season, Brad Keselowski's dedication to a full season in NASCAR Nationwide Series made was pivotal him only 1of 12 drivers have carried out a full Nationwide Series schedule. Remembering just 4 seasons ago, Brad Keselowski was an unproven talent without a permanent stock car ride. Keselowski's future changed at O'Reilly Raceway Park when a truck team needed a substitute driver to replace their recently suspended wheelman. Taking pole and leading a considerable number of laps, the performance was enough to attract JR Motorsports to the Michigan native. Entrusted to the #88 Chevrolet in the NASCAR Nationwide Series for two full seasons, Keselowski won 6 races but was no match for the division's championship. Finishing 3rd in the points both 2008 and 2009, Brad Keselowski was bested by NASCAR Sprint Cup regulars in previous seasons. For 2010, Keselowski entered the ranks of full-time Sprint Cup Series by signing with Penske Racing but still had unfinished business inside of the Nationwide Series. This year with the support of Penske Racing's farm team, it was the Michigan state driver's turn to claim superiority. 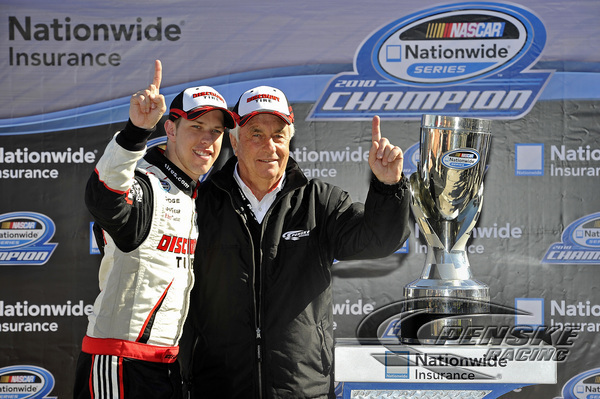 A first title for Brad Keselowski, this championship is also the first in NASCAR for mega owner Roger Penske.